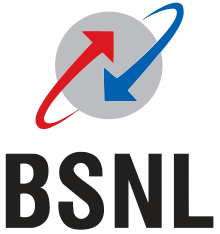 Bharat Sanchar Nigam Limited (BSNL) is an Indian state-owned telecommunications company in New Delhi. It was incorporated on 15 September 2000 and took over the business of providing of telecom services and network management from the erstwhile Central Government Departments of Telecom Services (DTS) and Telecom Operations (DTO), with effect from 1 October 2000 on a going concern basis. It is the largest provider of fixed telephony and broadband services with more than 60% market share and Fifth largest mobile telephony provider in India. However, in recent years the company’s revenues and market share have plummeted into heavy losses due to intense competition in the Indian telecommunications sector. BSNL is India’s oldest communication service provider and had a customer base of 93.29 million as of June 2015. It has footprints throughout India except for Mumbai and New Delhi, which are managed by Mahanagar Telephone Nigam (MTNL).